These courses are now bundled at a special rate of $197 US. 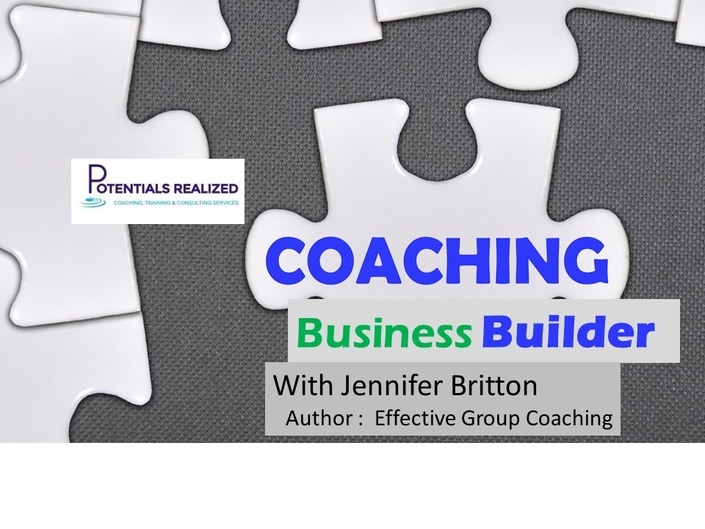 Join Effective Group Coaching author, Jennifer Britton, for several hours of on-demand video lectures, and exercises geared to move your coaching business forward. This special bundle includes these three on-demand video courses you can take a t your own pace. In the Coaching Business Builder Jennifer puts on her former business advisor hat, to bring you the Coaching Business Builder Foundation program. She has distilled content in 12 areas you will want to explore further as you build, and refine, the foundation of your coaching business. The program consists of more than 20 lectures, and several hours of audio and video. Most modules have an accompanying worksheet and/or activity geared to get you thinking about and into action around your business. On April 7, 2004 I opened my doors here at Potentials Realized and I haven't looked back! As we celebrate our 12th Anniversary, and move into our 13th year of business, I wanted to do something a little different than just a newsletter article. 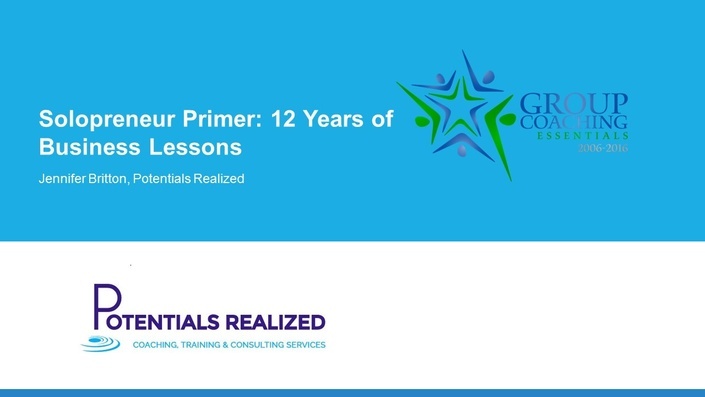 As an educator at heart, I wanted to share my lessons with the aim that it may make the road traveled easier for other service based solopreneurs.So....here's a three part series called The Solopreneur Primer(TM) - 12 Lessons from my first 12 years in Business. Just like a primer is, these are pretty elementary ideas, but together have created the course for a profitable, sustainable and fun business. I haven't always taken the easy road, AND, it hasn't always been easy. Twelve years into this journey I continue to wake up each morning excited to undertake my work and conversations with teams, organizations and individual clients. As a Toronto based performance improvement company offering training, coaching and consulting services no day is the same! AS an author, I know the power of the story and have seen the impact of my teaching in the work of hundreds, if not thousands, who are undertaking group coaching around the world. I hope that you will enjoy this brief Masterclass, and be sure to download the mini-workbook that accompanies it. The Marketing Tips for Your Group and Team programs course addresses 7 key success areas for marketing, along with 9 tactical tips for filling your group and team programs. We also explore five promotional strategies commonly used to spread the word about programs and build your platform – networking, blogging, article writing, speaking and social media. You will explore what strategies and approaches work best for you and your clients/students/participants. I'll also be challenging some of the commonly held myths about marketing group and team programs. Explore opportunities facing you and prioritize them into immediate, medium and long term. The program includes almost 30 lectures, more than 12 worksheets, and several hours of video. corporate engagements.I've also trained, spoken to and connected with thousands of coaches around group and team coaching issues in the last decade. For those that join us in the fall of 2016, join Jennifer for 2 live calls where she'll answer your questions around coaching business development. These will be held on Friday December 2nd and Friday December 16th from 1:30 - 2:30pm on zoom. Registrants will receive an invite to these calls. Well known for her practical and applicable approaches with learning, Jennifer Britton is based in the Toronto, Canada. She is the author of five books including PlanDoTrack Workbook and Planner (Forthcoming 2019) and the Coaching Business Builder (2018). Both books are geared to helping service based and virtual professionalsgrow their work and impoact! She is also the auotor of the world's first book on Group Coaching, published almost 9 years ago - Effective Group Coaching (Wiley, 2010) and From One to Many: Best Practices for Team and Group Coaching (Jossey-Bass, 2013). For the last two and a half decades Jennifer has taught, coached, and trained professionals all over the globe. Involved in formal and informal education since the late 1980s, Jennifer has taught tens of thousands of hours at post-secondary institutions, through online programs, workshops, retreats and in classroom based training. She's led Train-the-trainer workshops, and coach-the-coach sessions for more than 15 years. In 2004 Jennifer founded Potentials Realized, a Canadian-based performance improvement company dedicated to supporting leaders, teams and organizations with leadership, teamwork, and performance issues. Leadership and teamwork are two topics Jennifer is passionate about. During the first thirteen years of her career Jennifer worked with the United Nations, and other international organizations as a Program Director and Program Manager. By the age of 26 she was leading and directing programs involving hundreds of staff and volunteers, and dozens of communities, demonstrating the real power of collaboration and teamwork. This focus on exceptional team leadership, collaboration and capacity building continues today in her training, educational programs, coaching and consulting work. Her work today is varied including coaching teams, as well as working with new and experienced leaders including virtual team leaders. Jenn also works with solopreneurs, particularly those in the coaching and training industries, who want to create exceptional programs for their own clients. Building onto several years of teaching business studies as the post-secondary level, her work with business owners is grounded in support of creating a powerful vision, honing their leadership foundations, and creating a business that works for their needs and lifestyle. An avid writer, Jenn leads the Teams365 blog for team leaders, and the Group Coaching Ins and Outs blog for coaches. This portal, the Learning Lab and Design STudio, houses the many video based programs Jennifer has developed since 2014, as well as our 2016 long-term live community group at the Learning Lab and Design Studio which meets on Fridays. An avid practitioner herself, Jenn continues to deliver in person and virtual programs for leaders and their teams, as well as for service based professionals (coaches, consultants and trainers). Jennifer also offers International Coach Federation approved Continuing Coach Education programs through Potentials Realized - The Group Coaching Essentials(TM) Teleseminar (8.75 CCEs), and the Advanced Group and Team Coaching Practicum (10 CCEs). Jenn holds a Masters in Environmental Studies, a Bachelor of Science in Psychology. She is also a Professional Certified Coach, and a Certified Performance Technologist. You can visit her online at Potentials Realized or at the links below.